Some people have the unhappy reality that they did not attach well as a child. The disconnect with their own parent(s) has damaged their own ability to have a strong love bond with others. They recognize where they fall short as spouse or parent. What happens if you didn't attach or connect to your parents as a child? Is it possible to attach to your children? Do you have trouble connecting with others in relationships as an adult? Let's learn how to build connection even if you didn't attach as a child. 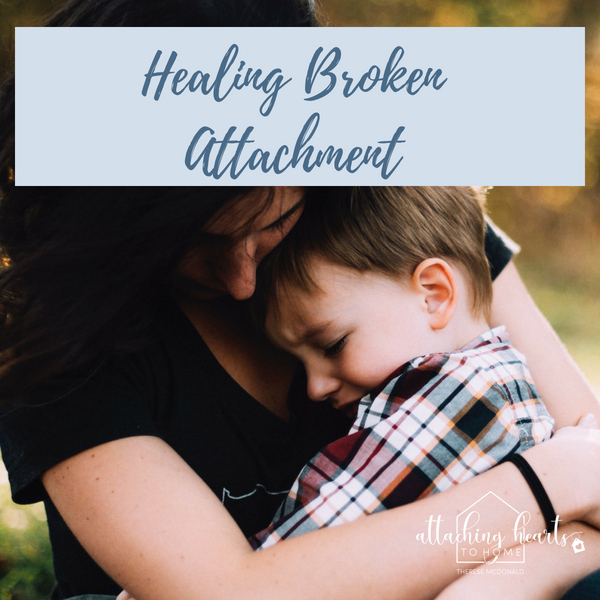 Often times, for the person who didn't connect as a child, there is no difficulty in seeing a need, or even knowing full-well what the response should be -- but alas, they feel stuck and unable to change their lack of connection. *They see their spouse needs affection or empathy but are passive about it. *They know a child needs time and presence, or advice but feel at a loss to provide it. *A husband looks to his wife for compassion and understanding and experiences a coolness instead. *A wife wants deeper conversation with her husband and finds him distant. *They find themselves running from family life, filling their time with shallow or distracting pursuits. *They recoil at physical touch and avoid intimacy. *They lack trust in those whom they should trust. *There is an elusive "something" they seek that lingers under the surface and is never satisfied. When things get tough, the wound of detachment determines the reaction – withdrawal and non-communication. When engagement is needed the most, the one with an injured heart is unable to give like they should. Unfortunately, this creates more distance in relationships. and unhealthy patterns and habits. Once a person has a track record of disengagement, they find themselves isolated to lesser and greater degree. They end up in a cycle of disappointment in themselves and they disappoint others. How then to create attachment in someone who never had it in their crucial younger years? Gain understanding, knowledge and awareness of the impact of damaged early attachment. In knowing why we behave the way we do and the process we go through to protect ourselves is very important. Awareness opens the door to optimism, hope, and healing. Get help with this by visiting a counsellor, coach, mentor, or guidance/spiritual director. Make a list of priorities concerning those categories/areas of life that need to change most. What do others need from you and what do you need to do for you? Chart out or road-map (with help) your goals, specifics on how to achieve them, and a means to stay on track and stay committed. Have an accountability person in your life who offers you support, stability, advises you through difficult periods, and can walk with you as you change patterns of behaviour. Get help with opening up, sharing your heart, and learning ways to love yourself, accept the love of others, and learning how to be intimate in a well-rounded way. Practice love in action based on the plan you chart out (see above). Practice becomes habit, and habit will become virtue. You are not stuck. I want you to be free to receive love and give love. This is a reasonable and attainable goal. If you did not connect in a normal way with your parent(s), this has imprinted you, but the impact does not have to be permanent. Take a step today in getting some help, and onward! Need more support? I work one one one with all kinds of attachment issues. Book a 20 minute discovery call and see if you have an attachment issue that needs healing and support.